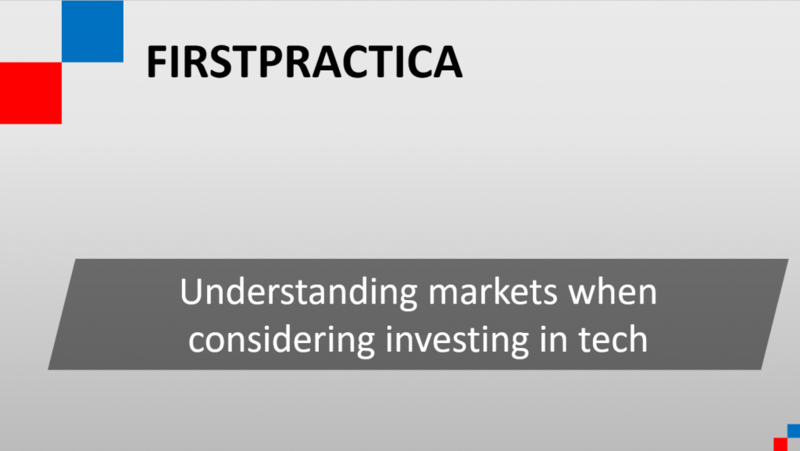 FirstPractica provides technology consulting to investors, venture capitalists and investment banks looking for deep technological insights from practitioners. As venture capitalists and investment banks your challenge is to understand what’s more likely to happen in technology and in the markets. We help you anticipate trends. If you can anticipate a movement before it goes mainstream this puts you in the position of buy low and selling high. You may also keep the equity once a business has gained enough scale. What matters is your ability to understand how technology impact customer behavior. This shift impacts the entire ecosystem of partners, developer community, competitive landscape, and the positioning of vendors. Can a tech company sustain competition? All businesses are subject to competition. Some competitive advantages in tech are long lasting: it can be hard to any other company to replicate intellectual property that took years to craft, or a large installed base of users and partners that creates inertia for other players to enter that market. Likewise when tech companies store data relationally or using app-specific workflows that data can be harder than it appears to migrate off of. Venture Capital and Investment Banks place bets on the competitive dynamics and the vendor’s ability to sustain them. Users are also trained and used to the workflow, so switching vendor also entails convincing and re-training the user base. Other factors that make competitive strengths can include renegotiating contracts with the alternative vendor, which can consume a significant amount of resources and discourage switching. On the other hand technologies go through major shifts from time to time, and these shifts can turn a competitive strength into fragility for incumbent vendors. This is where startups create new markets, redefine how tech is built, deployed and used. Can it raise prices and under what conditions? Venture Capital and Investment Banks value the ability for vendors to raise prices over time. Vendors often raise prices in two ways: because they can, without adding new functionality, or when they do add new features. In the latter case, creating new and more expensive plans keeps existing customers at price parity, while enabling those looking for new features to select the higher plans. Raising prices when adding new features tends to be more culturally acceptable: customers pay more to get more, instead of just getting a price increase. The key element is whether vendors have enough unaddressed product innovation ahead of them to create such new plans and offerings given the technology available, the nature of the product and the competitive landscape. How hard is it to migrate off a technology stack to another? A related discussion to that of sustaining competitive advantage, and sustaining competitive pressures, is to consider how hard it is to migrate from a product to another. Historically, migrations have been a high topic of interest in the tech community. Many tech vendors created migration programs, while the success of these programs has often been limited. When a customer implements a stack it commits at the business level, through contracts, invoicing systems, trains its employees, then integrates the product with application programming interfaces (API), workflows for data-in and data-out, creates reporting, and so on. Migrations are often time-consuming and with uncertain outcome. It takes substantial drive and pain points to migrate, when switching costs are high. For that reason, tech vendors that are new to a market and looking to grow fast tend to target new deployments, not migration paths. This is also the idea behind Blue Ocean strategies. This is a book to read for Venture Capital and Investment Banks looking to better understand the subject. How can Venture Capital and Investment Banks define the market for a given company? Analyst and research companies often define markets in clear buckets. For example the CRM market includes vendors of CRM software, but not close equivalents. Consider social media platforms like Facebook, Twitter, Linkedin. Do they store information about people involved in buying decisions? Do they know which companies these people work for, their title? Do they provide tools for customers to interact with their vendors? You bet. There are many adjacent markets to any defined market, and these adjacent areas are often not on the radar, while being core to the study of the said business or market. What’s the impact of a recent or past acquisition on the acquirer? Acquisitions in tech are hard. It takes a minute to write a check. It takes thorough planning and execution to make this check worth the acquisition. Sometimes the acquired company flourishes, when the job is done right. Other times, the integration fails to yield value for customers and as a result, for investors. What types of companies make sense for M&A? The conversation of defining the boundaries of markets leads to specific vendors. Whether they make sense depends on several factors: are the tech stacks they are built on, synergistic with the potential acquirer, or will they dilute the engineering efforts and potentially confuse customers? 1+1=3 concept: can the acquirer upsell and cross-sell the products to its installed base, plus to its existing product to the customers of the acquired company? Does the acquisition overlap with other in-house products and if so, what’s the plan to rationalize them? How do the strengths of one company compare to the strengths of another? Once at scale, vendors exist because they have unique value or enough of a brand to attract and retain customers. The review of strengths provides insights into the ability to sustain competition. It also provides a view into the windshield, into the future: what do those strengths look like a year from now, 5 years from now? What are the trends and driving forces in the next few years for a given market or company? Related to strengths and their ability, or inability to last, it’s often good to consider the new technologies on the horizon or potential new business models that might disrupt an industry, or that industry players could use to their advantage to grow and bring more value to customers. How to interpret the P&L, gross and operating margins for a tech company? Another important topic of study for investors are the income statement and the balance sheet. Depending on where a tech company decides to focus on growth or profitability, P&L percentages vary widely. Some companies benefit from high gross margins and pay dividends – mostly when their growth rates are slowing. Others reinvest all they can to boost the top line, while breaking even or running losses. Who’s the typical buyer for a given type of technology? Understanding the buying cycle for a given product or for a given company or market provides Venture Capital and Investment Banks the story of what happens to get a deal done. Most of the time one department and its executive sponsor are going to be the drivers to bring the product into the company. From there, that product will have to meet the needs of the Legal department, and other teams that will be either using the product, or relying on it for their jobs. You need to find the deal sponsor, while convincing potential deal blockers to accept the new product.